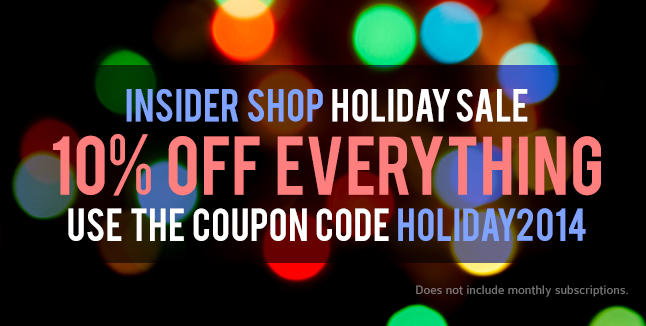 The past couple of years, we've had a special Holiday Bundle over at the Insider Shop, but this year we're trying something a bit different: 10% off everything storewide, with the coupon code HOLIDAY2014. We know we're a little bit late getting this out there, but there's still time to order Techdirt gear for Christmas! Domestically, for USPS Standard Shipping, orders made by December 15th (that's next Monday) should arrive in time, and there may be express options available depending on your location. For more detailed information, consult this shipping calendar, and try to order soon just to be safe! The European Union has its own revolving door, one that allows lobbyists to enter government agencies in order to directly regulate the same industries they so recently stumped for. Maria Martin-Prat went from directing "global legal policy" for IFPI (the international RIAA) to being the EU Commission's point person for copyright issues. "private copying has no reason to exist and should be limited further than it is." The private copying exception varies from country to country, but in Martin-Prat's mind, the best case scenario is likely "not at all… anywhere." So, why is Martin-Prat, an admitted hardliner on copyright issues, suddenly discussing the unfairness of certain copyright contracts? Speaking at a Westminster Forum seminar, Maria Martin-Prat, EC Head of the Copyright Unit for the Internal Market Directorate General (DG MARKT), said the Commission should look at whether contracts were fair. She told us that the infinite assignment of rights that authors must agree to in most EU countries to get their work published was what she had in mind. In the digital era, freelance authors and photographers in many members states have been asked to assign their rights to an intermediary in “infinite” deals. Forever contracts are, indeed, the sort of unfair deal that the EU Commission should take a longer look at. Here in the US, the reversion of copyright back to the creators (for pre-1976 recordings) has prompted record labels to argue that everything created was a "work for hire," and thus belongs to the label in perpetuity. (This argument also took the form of a midnight run to Congress to get copyright law amended in the recording industry's favor.) An infinite contract obviously closes that potential loophole for artists to reclaim their work after a reasonable amount of time. Seems like a good start, but Martin-Prat continues, dispelling any notion that serious copyright reform will occur under her guidance. Ah, the old "the Internet owes everyone a living" argument, wherein (probably) Google is blamed for every low number on the copyright industries' balance sheets and asked to kick in to make up for the shortfall. Note that Martin-Prat asks "who gets the profits," rather than asking how to divide the profits, which indicates she already has an answer in mind. Why address problems in any logical fashion when you can just use the weight of the EU Commission to make internet services bend to the will of misguided court decisions and nearly two decades' of useless complaining from the recording industry? Then Martin-Prat steps even further away from copyright moderation and takes a swing at the few remaining rights purchasers of creative works have, citing specifically the UsedSoft decision, which agreed that sold software was a "license" rather than a sale, but despite this distinction, could still be resold. So, it looks as though Martin-Prat will be pushing back on this decision in order to remove something that actually helps sell new software -- the possibility of resale. Whether the copyright industries like it or not, people consider this factor when purchasing new items and if the possibility exists to make something back, it actually encourages a few more sales. There's nothing inherently "unfair" about not being able to profit from every sale, but the industries still think it's just another way they're being screwed -- hence the push to call everything a "license," even if it's a physical good. Martin-Prat offers to take on an inherently unfair contract (the infinite copyright contract) but only because she has a desire to protect other unfair contracts (you can't resell what your purchase). The first will likely end up riddled with loopholes (for all intents and purposes, most recording contracts may as well be "infinite," considering how hard it is for artists to reclaim their copyrights) and the latter will just help the industries further pare down the few copyright law exceptions that currently exist. For years, we've been covering a key legal fight in the music business, involving Eminem's producers, FBT, and Universal Music, over how much was owed on iTunes sales. The key issue: is an iTunes purchase a "sale" or a "license." Older music contracts that predated the internet era tended to focus on sales, in which artists tend to get about 15% royalties. "Licenses," on the other hand, tended to be for things like commercials or movies, but commanded around 50% royalties. But when you talk about iTunes songs, you can make somewhat compelling cases that it's either a sale or a license, depending on which details you focus on. Universal Music, of course, insisted that it was just like a CD sale. FBT argued it was just like a license. There are a ton of other similar lawsuits ongoing, but after losing at the district court level, FBT won on appeal. That resulted in a somewhat insane and contentious fight over how much Universal would have to pay up, with a judge slamming Universal for hiding revenue with tricky funny money accounting, and even trying to expense the cost of this very lawsuit back against what they owed. However, the damages phase of the case was set to go to trial in the spring, and it would have (1) revealed an awful lot about the blackbox of Universal Music's accounting practices and (2) given a roadmap for the many other similar lawsuits against Universal Music (and the other major labels). Given that, it should come as no surprise that Universal Music scrambled to come up with a way to get FBT to settle... with the terms of the settlement being secret. This almost certainly means that UMG paid through the nose, with the hope that it makes it more difficult for other artists to get similar rewards, and while allowing Universal to keep its secrets secret... for now. For a few years now, we've followed the lawsuit between Eminem and Universal Music concerning digital royalties. The basics are that the record labels offer incredibly low royalties on sales of music media, such as CDs. However, when it came to "licensing" music (generally for movies or commercials or whatever), it offered a much higher payout to the artist. This made some amount of sense under traditional label thinking, since selling product actually involved a fair amount of costs and work. But licensing a song for a movie was pretty simple. So, the question that Eminem (and some other artists in other lawsuits) asked was: what is iTunes? Is it a "sale" like a CD, thus entitling the artist to low royalties? Or is it a "license," like for a commercial, entitling him to 50% royalties? Reasonable arguments can be made on both sides, and since the recording industry has a habit of a quantum-like switching where it pretends that something is a sale when it wants it to be a sale, but then insists it's just a "license" when that's beneficial, it felt pretty good about its chances in the lawsuit. And while Universal Music won at the district court, the appeals court went the other way, and said that iTunes represents a license. And, now, the Supreme Court has refused to hear the appeal, meaning that this ruling lives on in the all important 9th Circuit. It's possible that some other similar cases may come out with a different ruling in a different circuit, greatly increasing the likelihood that the Supreme Court steps in, but for now, it seems that the courts are saying iTunes is a license not a sale. While more recent contracts have been written to avoid this problem, it does seem like there are a lot of legacy contracts out there (which are tied to a lot of ongoing revenue via the back catalogs for the major labels) where this could be an issue. In other words, the record labels may owe a ton of money to artists. And they still think infringement is the biggest challenge they face? Having lost pretty much everything -- including most of its business and its longstanding lawsuit concerning Linux -- SCO is now apparently trying to sell off what remains of its "Unix assets," -- which, as you may have heard, does not appear to include the Unix copyrights. It's unclear what anyone would really do with whatever magical assets the sale comes with, but I would suggest suing IBM for infringement is not one of the better ideas. Until earlier this week, TJX held the record for the biggest-ever data leak, for its effort to lose track of some 94 million people's credit card info to a group of hackers. Just to recap, the company lost all the data largely through sheer incompetence, by encrypting its stores' WiFi networks with the easily broken WEP standard, and not having enough security in place to keep the hackers out of its central database after they'd gotten on the network at a single store. Even more astounding was the fact that TJX transmitted credit-card info to banks without any encryption. It was the banks that were largely left holding the bag for all the fraudulent purchases made with the stolen credit-card numbers, while several of the criminals behind the breach were charged, too. What punitive action was taken against TJX? It had to pay a $41 million fine to Visa, but got off with no fine and a wrist slap from the Federal Trade Commission. But apparently the company really wanted to make things up to consumers, so it offered a one-day 15 percent off sale in its US and Canadian stores this week. Wow, so generous, especially to do it in the post-holiday, lets-clear-out-everything-we-didn't-sell-before-Christmas season. You could probably forgive TJX for thinking this would make up for everything, though, since data-leak settlements and punishments are generally toothless and do little to encourage companies to take serious steps to stop the leaks.